I should maybe start giving Sheba treats after taking her picture. It's hard to get her attention. 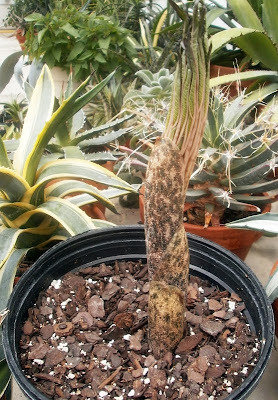 Back in February, I asked the hive mind whether my bulb was coming out of dormancy; I haven't had it that long (since April 2012), and am still getting used to what it does, and when. The response from readers was somewhere between "not necessarily" and "probably not." I went ahead and potted it up anyway, about six weeks after that, but it took forever to do anything visible. 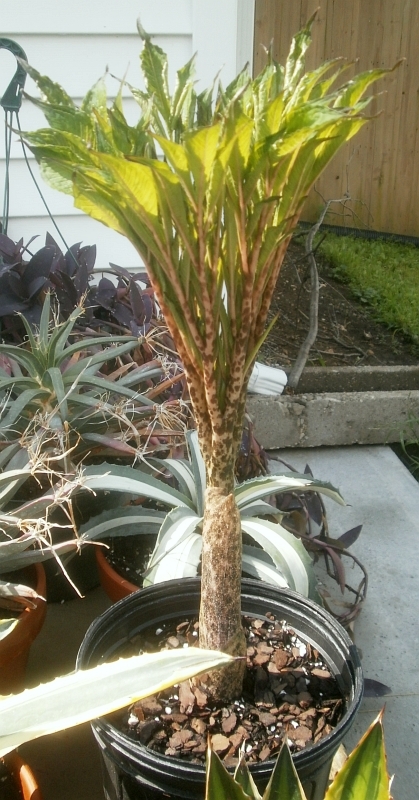 I started to get worried that it had rotted by late May / early June, just because it seemed like it had had more than enough time to grow, if it intended to, and I still wasn't seeing anything. 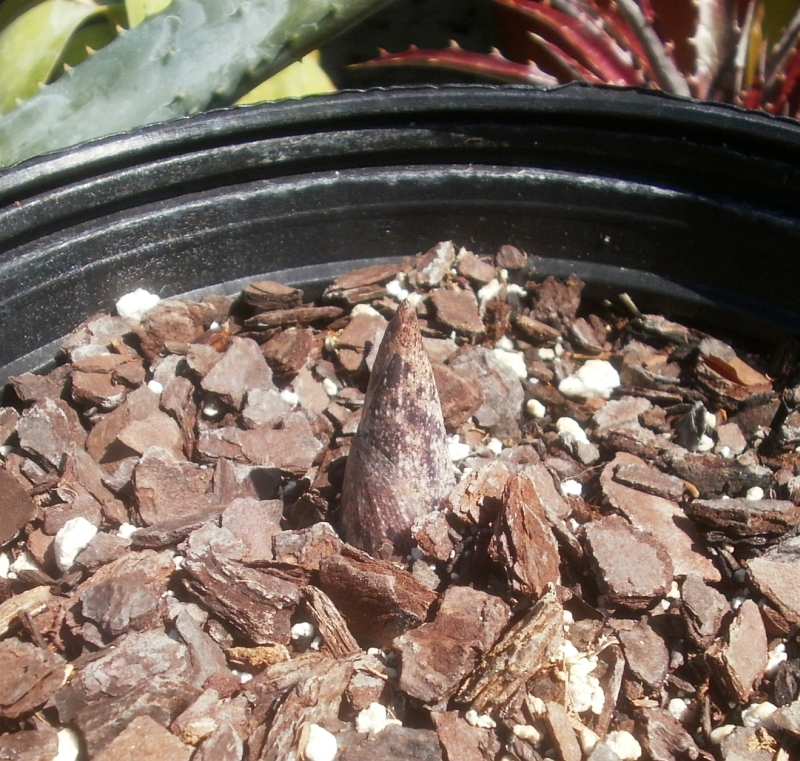 Out of laziness and hope, I left it alone, and finally, on 11 June, I saw the tip of a leaf poking out of the soil. After which point things progressed more or less normally. 22 June 2013. 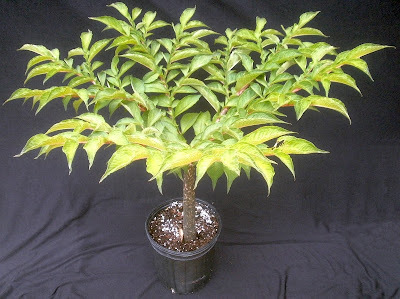 This is possibly my favorite stage of development for this plant. Like somebody stuck a squid headfirst into the soil. I'd thought, when this all started to happen, that it had started significantly later than in 2012, but when I checked the old posts here, it was basically the exact same date: the "squid" Amorphophallus picture in this post is dated 19 June 2012, as opposed to 22 June 2013. With any luck, I'll be able to remember this next year, and not spend so much time worrying about it. 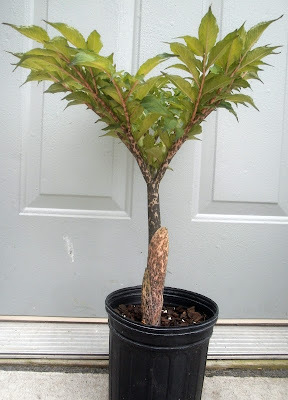 Speaking of Amorphophallus -- did everybody else see Zach's recent posts about propagating A. atroviridis from leaflet cuttings? If not, you probably should: the first is here, and the second is here. DISCLAIMER AND STUFF: I received a review copy of this book from the publisher. There was no agreement that I would necessarily write a review, and no agreement that if I did write a review, it would necessarily be a positive one. The Pocket Guide to Wild Mushrooms. Holmberg, Pelle, and Hans Marklund. Skyhorse Publishing, New York, NY, 2013. 128 pp., about 6.5" x 5"
This feels weird to write. I don't know anything about eating mushrooms. I don't like them on pizza (it's the texture), and I don't get a lot of other opportunities to eat them. I've also never deliberately hunted for them in the wild (though I have family members who used to collect edible mushrooms regularly, and may or may not still). So I'm not really in a position to have much use for this book personally, but . . . well, is it weird if I admit that I enjoyed it anyway, just as a bunch of cool pictures of mushrooms? 'Cause I do like pictures of mushrooms. 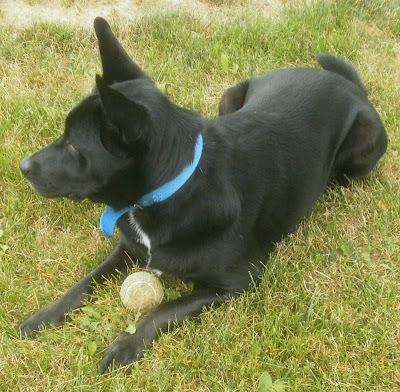 And these are awfully good pictures. Some books would just give you a picture of one specimen of each mushroom and call it good, but this book will show you what the cap looks like from above, what it looks like from the side, what the gills look like, what the whole thing looks like in cross-section, and what it looks like at various stages of growth. I appreciate the thoroughness. Better still, the book is very interested in making sure you can tell the difference between the mushroom you're looking at and any similar species, whether or not the other species are potentially dangerous. Granted, you'd expect that a book about wild-collecting edible mushrooms would warn you about anything that could sicken or kill you, as sort of a minimum, but I was still impressed that the book includes fairly detailed descriptions, photos, and key points of difference between the edibles and inedibles. The Pocket Guide to Wild Mushrooms also includes, when relevant, information about how to prepare the mushrooms you've collected, noting which ones can be dried, which ones need to be cooked for a minimum length of time (and what that length of time is), what parts can be eaten, ways they're best prepared, and so on. No actual recipes, but where preparation matters to the flavor or toxicity, it gets a mention. 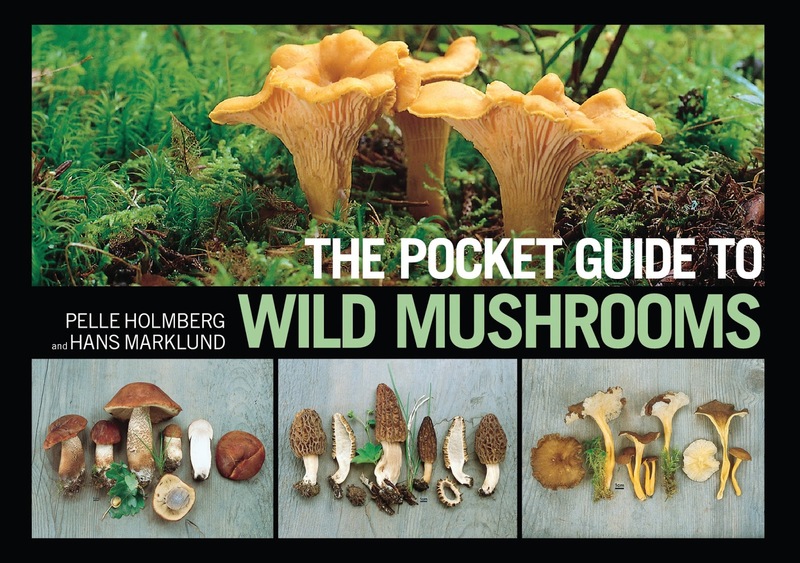 The worst thing about the book is probably that its geographical focus is narrow: it only really addresses mushrooms which are found in the northern U.S., Canada, and the UK. (This may be unavoidable: trying to include every edible mushroom and the potential lookalikes from every single part of the world would probably not wind up pocket-sized. One does kind of wish, though, that the title or back-cover description mentioned this somewhere.) So this is likely only useful if you live in the described region, but on the other hand, if you do, it looks pretty comprehensive. And it's a lovely book to look at either way. Overall? I'm glad I have it (when the zombie apocalypse happens, I expect we'll need all the foraging tips we can find), I liked looking at it, and I found it interesting to read even if I'm probably not going to use it for its intended purpose. Someone who was going to use it for its intended purpose would probably get more out of it, though, obviously. If you think you might be interested in this book and live in the U.S., Skyhorse Publishing has offered to give a copy to one PATSP reader. Leave a mushroom-related comment and an e-mail address where you can be reached if you should win. If you want to disguise your comment in some fashion to deter spambots, feel free: just make sure it's something I can untangle if the need arises. I'll choose a winner by random number on Thursday, 15 August 2013, and send an e-mail to notify him/r and get an address to ship to and whatnot. If there's no response from the winner by Saturday, 17 August 2013, that winner forfeits, and I'll pick someone else. EDIT 15 AUG 2013: a winner has been selected and notified. 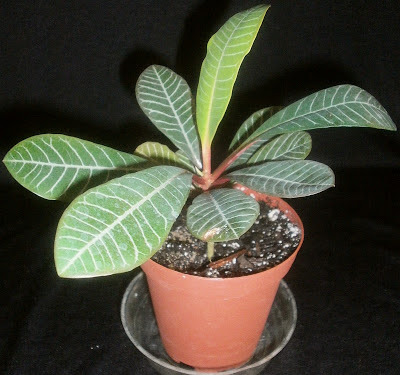 I posted about three months ago about having received some Euphorbia leuconeura plants. They weren't seedlings or anything, but they were small enough, considering how big I knew they can get, that I wasn't expecting anything much to happen with them for quite a while. Now, a mere three months later, I'm seeing the first flowers, which for some reason surprised me, even though I've seen pictures of the flowers before. I'd just forgotten. I was maybe also surprised by the flowers because they're unusual for Euphorbias: most of the Euphorbias in cultivation that I've seen either have small yellow or yellow-green flowers (e.g. 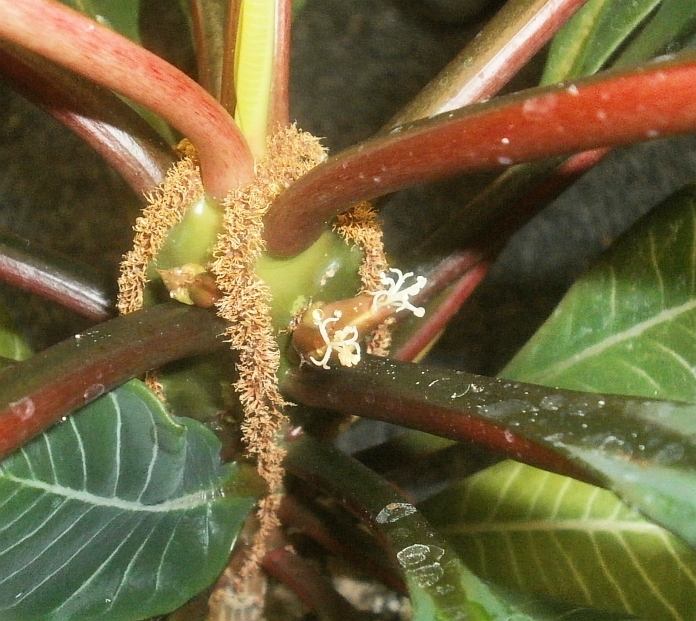 E. grandicornis) or relatively big, showy bracts (E. pulcherrima, E. milii). This doesn't look like either of those. 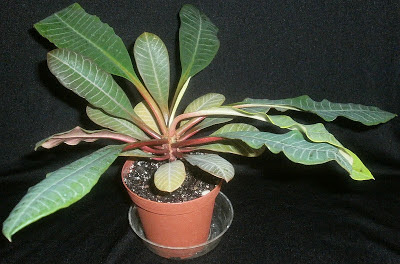 In fact, I kind of question whether this should be a Euphorbia at all. I mean, no doubt it is. The taxonomists have their reasons. But it's an odd bird. 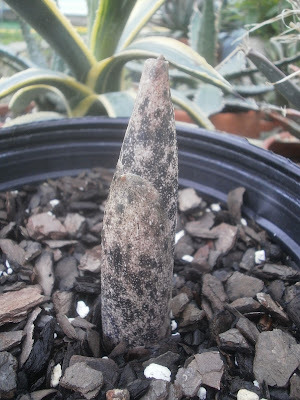 The advent of the flowers means that I will soon have seeds: E. leuconeura is self-fertile. The plant ejects the seeds explosively, though, so if I want to collect seeds, I'll have to put the plants in plastic bags or something. No doubt this will happen eventually. So I'm thinking it's time for an update on the Coffea arabica seedlings. The last time we checked in with them, in April, most of them had germinated, but there were no leaves to speak of. By early June, most of the seeds had produced some true leaves. 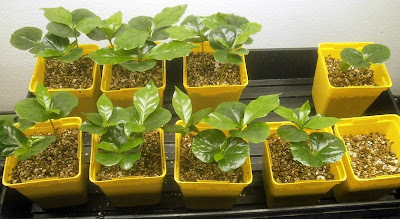 I never did get germination from most of the group of seeds that I dried for four or five days (the three pots on the right), but the seeds dried for eight weeks (the six pots on the left) all did well. 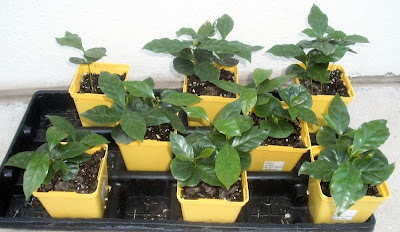 So in summary: all 18 of the eight-week seeds germinated and survived transplant; only 4 of the 9 four-or-five-days seeds germinated, and only 3 of those survived transplant. Clearly an eight-week dry is better. 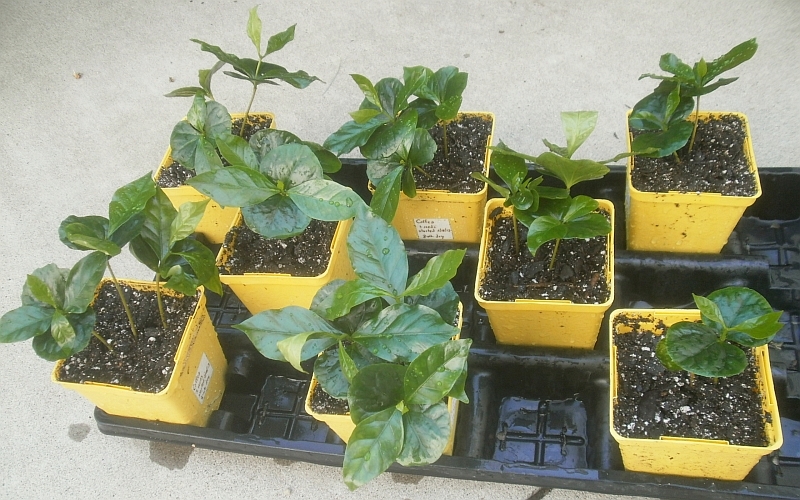 I moved them outside after transplanting, too, which seems to have been fine. By mid-July, they all appeared to be in good shape. 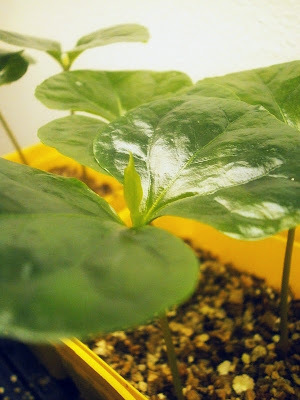 As of 2 August, there's some chlorosis starting on a few of them, which no doubt has to do with the fact that fertilizing the plants outside is a little more complicated than fertilizing the indoor ones, so I don't do it as often. Perhaps they should come back inside. 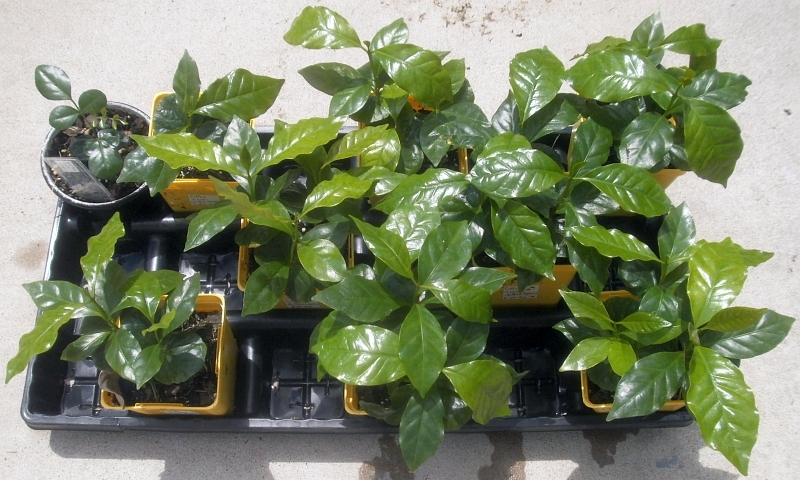 So they're not necessarily growing super quickly, or without any problems, but there's been a lot of progress since April, and I think the overall situation is still good. 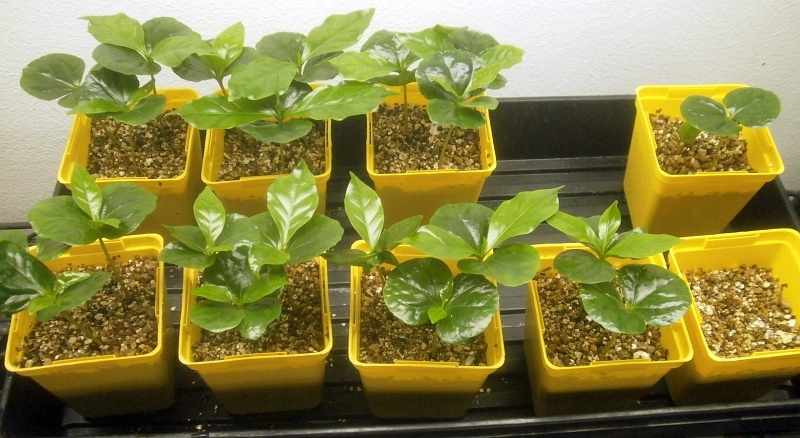 If nothing else, I've got a much better understanding of why small Coffea arabica plants are for sale everywhere I go: they're just really easy to produce, and you don't have to have all that many stock plants producing berries. Right now, my parent plant has at least a couple hundred berries developing on it, with a handful of flowers besides, and it can't be more than about eight years old. I don't know if I want to germinate all the seeds, when the berries are ripe, but I'm not ruling it out. 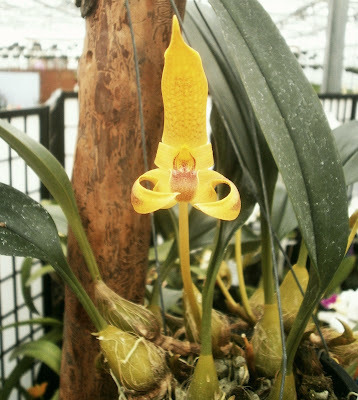 The leaves are more interesting than the flower, n'est-ce pas?